Ever thought of having your bridal party wear printed attire??? Well, how about it? One might say oh but they clash with the flowers in hand or they may look like a table cloth. I highly doubt that’s gonna happen if you carefully select a nice print for your maids or for your grooms-men. Especially for summer weddings, why not have your girls wear printed dresses? Not that you cannot wear high style prints for a spring wedding! When I say print I don’t mean only floral prints. Pick the print you like most. How about a Polka, or a leopard – come on I know there are many of you who love the leopard print – I’m sure you at least got a leopard printed shoe, let alone a dress??? Or better yet how about stripes (careful though, stripes might make one look fuller than usual…especially if it’s thick stripes and horizontally printed. I know these days most brides are opting for an Ombre of a particular colour. If it’s the colour pink then it would be an ombre of pink – light pink, hot pink, peachy pink and the list goes on. And there are still those who go for one colour for all the girls – not that there’s anything wrong with it. But… why not a printed galore??? If you don’t like a full printed dress, how about a half n half? And nope I don’t mean cream! To spice it up a little bit, why not a dress which has both worlds? Maybe even a skirt and top. Or better yet tulle and a print like the separates below? Being a south Asian myself, although white is a sign of purity, for weddings bold colours and prints takes centre stage…not only for themselves but their retinue too. Sarees have bold prints and embroidery work making the whole affair a mesmerizing sea of coloured prints. All this time I’ve been writing for the girls. Let’s give a shout out to the boys shall we? Why not dress ‘them’ in prints. I must say though, too many prints in your retinue will be a bad mash up and it might even clash with overpowering the couple as a whole…especially for pictures. My advise is if your going for printed attire for the girls go for solids for the guys. And vis versa. But I must say it’s so much fun to make the guys wear prints. Especially for the summer, a garden wedding or for a beach wedding where the blazers can be chucked, get the men to wear prints. The colours and the prints to choose from our endless. 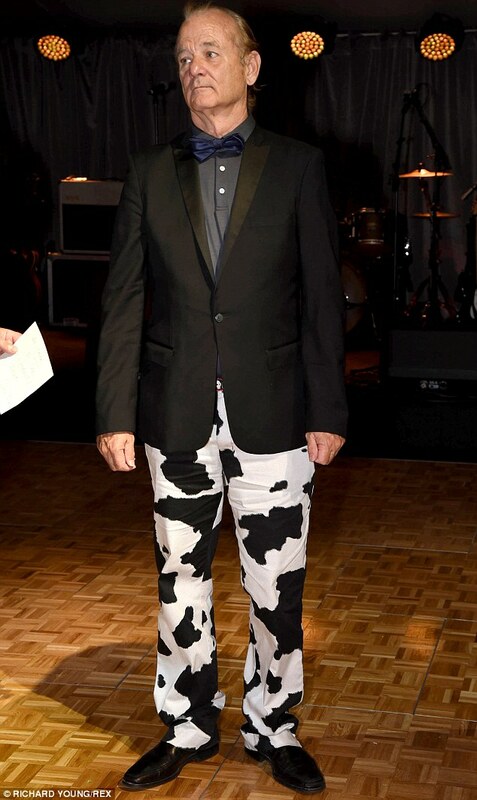 But…just to caution you, I would certainly stay away from this ensemble that Bill Murray wore…WHAT WAS HE THINKING? Apart from that …try the prints and see. I know some of you may give the free hand for your bridal party to choose what they want to wear for your wedding in the chosen colour scheme…but it is good to go with them and try out different attire and see what really works, especially if you have a liking towards prints…besides… its fun! A printed dress with solid colour shoes or a printed shirt with solid colour pants and tie will be so much fun to mix and match and a great way to bond with your retinue amidst planning for your wedding. As the saying goes (I altered it a little bit)…’Try’ different strokes for different folks.